Configure the way the client works with the MobileFirst Analytics Server, configure and view a wide range of reports using the Operations and Analytics Consoles. From the MobileFirst Analytics Console, view and configure the Analytics reports. Manage alerts and view client logs. You can open the Analytics Console from the MobileFirst Operations Console by clicking the Analytics Console link in the top-right navigation bar. After navigating to the Analytics Console, the default Dashboard panel appears. If a client application has already sent logs and analytics data to the server, the relevant reports are populated. The Apps and Infrastructure can be chosen from the navigation bar. In the Dashboard panel, you can review collected analytics data related to application crashes, application sessions, and server processing time. Additionally you can create custom charts as well as manage alerts. In the Apps panel, you can review in-depth analytics data related to usage and devices (such as total device and app sessions, active users, app usage, new devices, model usage and operating system), as well as crash-related data. Search through client logs for specific apps and devices (Apps → Client Log Search). In the Infrastructure panel you can review analytics data related to: session processing time, average request size, server requests, network requests, adapters response time, procedure response time, and size and adapters usage, as well as push notifications data such as notification requests and per mediator. You can also search through server logs. Learn more in the Analytics Workflows tutorial. Note: The client/server log Search and Export data functionality does not invoke an action on mouse click event when the date filter is modified, as observed in recent versions of Chrome browser. This behaviour is caused due to a problem with the Chrome browser and also due to a known limitation. This issue does not occur in other browsers and in Chrome browser versions prior to v54.0.2840.71. In the most recent versions of Chrome browser, users can work around this issue by setting the date required and then refresh the page before clicking on the Search/Export button or can hit the Enter/Return key to perform the selected action. From the Apps → Usage and Devices tab, you can view App Session charts and App Usage charts to find out which app is being used most frequently by your users. When you use the MobileFirst client SDK together with the MobileFirst Server, analytics data automatically gets collected for any request that your app makes to the MobileFirst Server. From Dashboard → Overview view basic device metadata that gets collected and reported to the MobileFirst Analytics Server. You can have your app send custom data and create custom charts for your custom data. Learn how to send custom analytics in the Analytics API tutorial. Custom charts allow you to visualize the collected analytics data in your analytics data store as charts that are not available by default in the Analytics Console (Dashboard → Custom Charts). This visualization feature is a powerful way to analyze business-critical data. Learn how to create custom charts in the Creating Custom Charts tutorial. Alerts provide a proactive means to monitor the health of your mobile apps without having to check the MobileFirst Analytics Console regularly. From the Dashboard → Alert Management tab, you can configure thresholds which, if exceeded, trigger alerts to notify administrators. You can visualize the triggered alerts on the console or handle them by using a custom web hook. A custom web hook allows you to control who is notified when an alert is triggered, and how. Learn how to manage alerts in the Manage Alerts tutorial. App crashes are visualized on the Analytics Console (Apps → Crashes), where you can quickly view crashes and act on them accordingly. Crash logs are collected on the device by default and sent to the server once the application is running again. 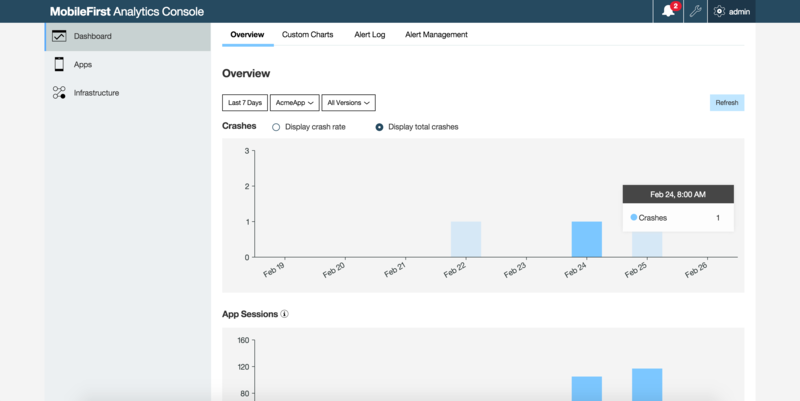 When crash logs are sent to the analytics server, they automatically populate the crash charts. The Analytics Console monitors network data when it is sent to the Analytics Server, and allows the user to query this information in different ways (Infrastructure → Servers and Networks). Client logs can be sent to the server and included in analytics reports. From the Analytics Console, choose the Dashboard → Custom Charts tab. Choose Client Logs from the Event Type pull-down menu. For more information on Custom Charts, see Creating Custom Charts. Logging data can be filtered. Log filters can be configured and saved on the Analytics Server, and then retrieved by client applications. For information on configuring log filters, see Client log searches tutorial. For more information on sending logs from the client, see Client log collection. 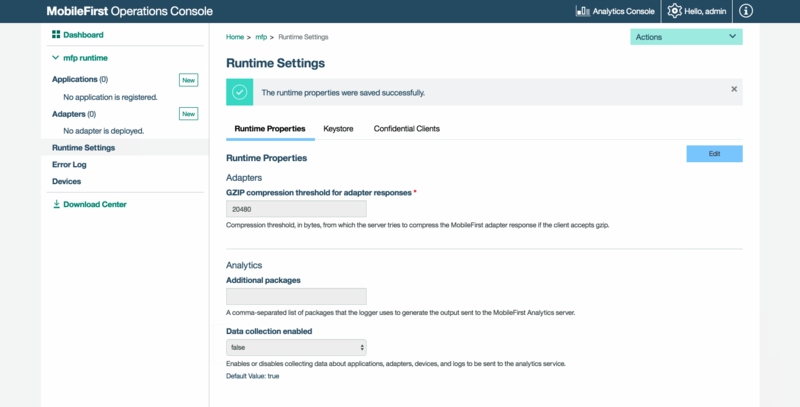 Configure and administer the Analytics Server with the MobileFirst Operations Console. If you are in the Analytics Console, access the MobileFirst Operations Console by clicking the Operations Console button in the top navigation bar. By default, only logging from the package com.worklight is sent to analytics. In order to add logging from additional packages see Forwarding logs to the Analytics Server. The collection of data for analysis by the Analytics server is enabled by default. You can disable it, for example to save processing time. In the navigation sidebar, click on Runtime settings. To avoid inadvertent changes, runtime properties are displayed in read-only mode. To make the settings editable, click the Edit button. If you logged in with a role other than administrator or deployer, the Edit button is not visible because you are not allowed to modify runtime properties. From the Data collection enabled drop-down menu, select false to disable data collection. Click the Read Only button to lock the properties again. Content in the Analytics Console is restricted by predefined security roles. The Analytics Console displays different content based on the security role of the logged-in user. The following table shows the security roles and their access to the Analytics Console. Developer analytics_developer Everything except for the Administration pages. Everything. Support analytics_support Everything except for the Administration pages. Everything. Business analytics_business Everything except for the Administration and Infrastructure pages. Everything. For information on setting up roles, see Configuring user authentication for MobileFirst Server administration.